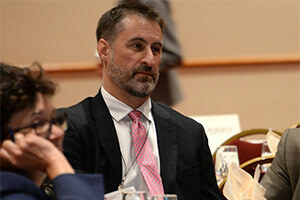 The DFMCH’s Randall Brown, MD, PhD, FASAM, pictured above at a plenary session, and colleagues hosted the 2017 Addiction Health Services Research Conference. Randall Brown, MD, PhD, FASAM, and University of Wisconsin–Madison colleagues hosted 180 addiction medicine researchers, clinicians and policymakers from the U.S. and Canada at the 2017 Addiction Health Services Research Conference, held October 18-20, 2017 at Monona Terrace. The event, which has been hosted at a different institution every year since 2005, fosters collaborations between investigators who, despite diverse backgrounds, are all working toward a shared goal: to improve prevention and treatment strategies for people with substance-use disorders. The event kicked off with a day of preconference workshops focused on social networks analysis, qualitative methods for studying behavioral health interventions and grant writing for new investigators. Following a welcome from Dr. Brown, the next two days offered four plenary sessions led by speakers representing the office of U.S. Senator Tammy Baldwin, the National Institute on Drug Abuse (NIDA), the Substance Abuse and Mental Health Services Administration and several major research universities, including UW-Madison. 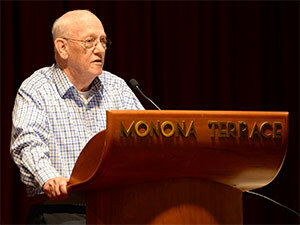 David Gustafson, PhD, an emeritus research professor in the UW College of Engineering’s Department of Industrial and Systems Engineering, was one of the plenary speakers at the conference. Those speakers covered such critical topics as NIDA funding priorities; how federal agencies can better address substance-use disorders; the Surgeon General’s report on alcohol, drugs and health; integrating behavioral care in medical settings; health IT innovations; and systems interventions to support substance-use treatment. Rounding out the conference were 23 breakout sessions and a poster session with 53 participants, three of whom received awards. This award is offered at AHSR to early-career applicants who are no more than five years removed from their terminal research degree, and have not served as a principal investigator on an NIH R01 or equivalent research grant. New to AHSR in 2017, the Underrepresented Investigator Award supports conference participation of investigators who are underrepresented in terms of their self-identified gender, race, and/or ethnicity. 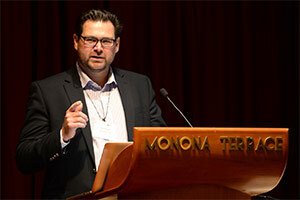 The DFMCH’s Andrew Quanbeck, PhD, chaired a breakout session and served on the conference’s planning committee. Evaluations showed that participants valued the meeting’s scientific content, the variety of presentations, the organization of the event and its setting in downtown Madison. “Speakers and attendees are very passionate about their work and their enthusiasm is contagious,” noted one attendee. “I was exposed to new ideas and perspectives that will guide my practice moving forward,” commented another. The 2018 ASHR conference will be held October 17-19, 2018, in Savannah, Georgia, and co-hosted by Augusta University Institute of Public and Preventive Health, the University of Georgia Owens Institute for Behavioral Research, the University of Georgia School of Public and International Affairs, and Georgia State University. For details, visit the 2018 conference website. Read related article in the December ATTC Messenger, the newsletter of the Addiction Technology Transfer Center Network. Funding for the conference and awards was made possible in part by grant #R13 DA044722-02 from the NIDA and the National Institute on Alcoholism and Alcohol Abuse.